This TRP Video Converter allows you to convert TRP file to MPEG, FLV, H.264, 3GPP, MOV, DivX, XviD, HD video, etc. Also you can extract audio from TRP file with this TRP Converter. Tipard TRP Media Converter, the best and user-friendly TRP Converter, provides you with outstanding functions to convert TRP video to any other video and audio formats as needed. This TRP Video Converter allows you to convert TRP file to MPEG, FLV, H.264, 3GPP, MOV, DivX, XviD, HD video, etc. Also you can extract audio from TRP file with this TRP Converter. Moreover, this TRP Media Converter supports most portable devices, such as iPad, iPod, iPhone, Apple TV, PSP, PS3, Wii, Zune, Xbox, Sony Walkman, Google Phone, BlackBerry, etc. Tipard TRP Media Converter can help you convert TRP file to any popular video format, such as MPEG-4, H.264/MPEG-4 AVC, MOV, M4V, AVI, DivX, XviD, ASF, WMV, 3GP, FLV, HD video, etc. This TRP Media Converter can assist you to capture your favorite image from TRP video with the help of preview window. The TRP Converter can help you convert your preferred TRP segment by setting its start and end time. Also you can crop the video frame aspect and adjust the playing region. The TRP Video Converter can assist you to merge TRP video pieces together and output them to a single one. Furthermore, it enables you to add any image/text watermark to your TRP video. You are able to adjust the video Brightness, Contrast, and Saturation with the TRP Media Converter. And the Deinterlacing function can help you convert interlaced video to the progressive video to optimize the video effect. Tipard TRP Converter enables you to set the Video Encoder, Resolution, Frame Rate, Video Bitrate; Set the Audio Encoder, Sample Rate, Channels, Audio Bitrate. Tipard TRP Media Converter will list all audio tracks and subtitles available in TRP file for you to choose for the output video. This TRP Converter offers you numerous output formats for you to choose for the output video and audio file. 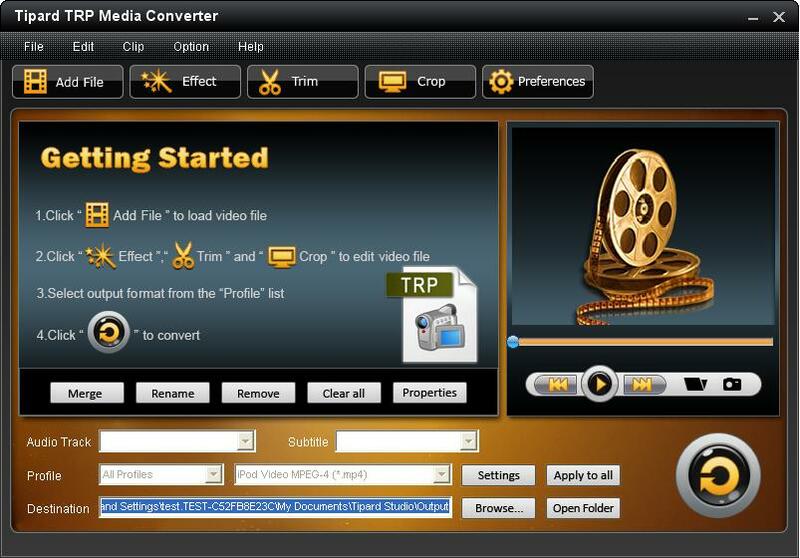 This TRP Media Converter provides you with the function of converting one TRP file to several output formats with only one conversion. You can preview the input TRP file and edited video effect to get a full control of the video effect before converting. Tipard TRP Media Converter provides you with highest converting speed.